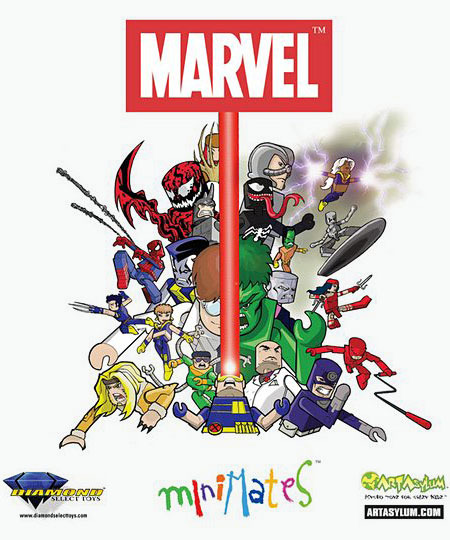 Back when Art Asylum first announced the Marvel Minimate license in 2003, they showed off a poster featuring 22 Marvel characters drawn in Minimate style. Most of the designs appeared on shelves pretty quickly, but there was one standout who took almost two years to be made into plastic: Lady Deathstrike. We've talked before about who Lady Deathstrike was and who she wasn't, so we won't rehash it here. Yuriko gets several new pieces, not the least of which are her large, clawed hands. Her loincloth isn't the same one Elektra wore, and no one had one of these vests before, either. Oh, and that headdress is new, too. Patch is Wolverine #8 - you may not have realized that, since he's wearing a cunning disguise! Seriously - this is supposed to be a secret identity for him. I suppose it's possible that the people of Madripoor are unfamiliar with the world-famous X-Men, or have never seen The Wolverine without his mask on, but still, it's not like he's ever going to be a guy who blends into a crowd. And if they really don't recognize a member of the X-Men, why would he need a disguise in the first place? His suit jacket was a new piece at the time, as was the hair - hair that has never been reused, amazingly enough. He also has plain hands, without any claws popped. Undercover, don't you know? 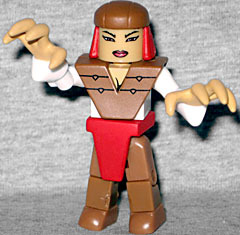 Lady Deathstrike and Patch really hit the sweet spot for Minimates: they had new add-on parts where they were needed, but didn't go overboard with them, and the pieces retain the blocky aesthetic. 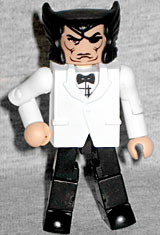 That's the way it should be, and it's a shame more modern Minimates don't follow suit. This entry was posted in Art Asylum, Marvel, MMMR and tagged Minimates, Wolverine. Bookmark the permalink.